Susskind (Urban and Environmental Planning/MIT; co-author: Water Diplomacy: A Negotiated Approach to Managing Complex Water Networks, 2012, etc.) outlines six principles which he insists will help negotiators bridge the gap between win-win–based methods and what they will actually need to ensure success. 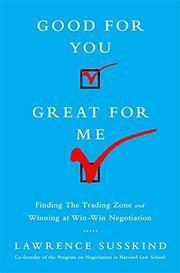 The author stresses that negotiators must move as rapidly as possible into what he calls “the trading zone,” where it becomes possible to begin to outline the terms of a successful deal. The co-founder of the Program of Negotiating at Harvard Law School, Susskind specializes in resolving disputes arising from environmental concerns. He has published extensively on the subject, and he draws on a wider experience than the back and forth of corporate-style wheeling and dealing. This includes working with not just corporations, but also with regulatory agencies, community groups and independent experts. Susskind's six principles are: helping negotiating partners' priorities by leading them into the trading zone; creating value for both sides; expecting the unexpected; helping the other side convince their “back table” decision-makers; building protection against surprises into the agreement; and developing an organization’s negotiating capabilities. The author provides a series of how-to examples from case studies without compromising the identities of those involved—e.g., “GreenTech Chemical Company” and its efforts “to install cleaner, ‘greener’ waste treatment technology” introduces a discussion of how to work with regulators by involving them early and building support among their staff by demonstrating consistent adherence to regulations. Each of Susskind’s principles requires research-driven preparatory work to develop understanding of partners' needs and methods. The author also discusses how coaching, team-building and other training methods can increase an organization's negotiating capabilities, and he offers innovative ways to head off foreseeable problems. These include eliminating head-butting showdowns over entrenched positions by obtaining agreements to use outside expertise. A useful guide with broad applications beyond the world of business. You Want MORE? Here's How To Get It!